This is the official channel for announcements and news about St1 Otaniemi geothermal project so you will always find the latest news here. To find more news about the project go to St1 Company & Press Releases. Under the information boxes, you 'll find the recording of the public event organised before the start of the stimulation stage (Finnish). At this page, you'll find also Frequently Asked Questions/Answers. If you have any questions or would like to give feedback, there is a feedback form at the bottom of the page. The emission-free energy form of the future is found underground. St1 is drilling to a depth of around 6.5 kilometres in the bedrock under Espoo, deeper than ever before in Finland. The goal of the St1 Deep Heat pilot project is to build the first industrial-scale geothermal heat plant in Finland at Fortum’s heat plant in Otaniemi. Geothermal energy is an exciting option in comes to zero-emission heat production. The success of the pilot project may revolutionise Finnish heat production. St1 has prior experience in sustainably produced, renewable energy, and geothermal heat is a natural next step for the company. The process to harvest and utilise geothermal heat is quite simple. First, two boreholes/wells of around 6.5 kilometres are drilled into the ground. One of the holes pumps water down to the bedrock in order to heat it as a result of the warmth in the earth’s crust. The hot water is pumped up via the other hole, and the produced heat is captured with a heat exchanger and fed into the district heating network. Once completed, the plant will produce up to 40 MW of energy. The heat produced by the geothermal heat plant will be purchased by Fortum for its district heating network. Penetrating the hard Finnish granitic bedrock requires both a purpose-built drill and some persistence. First, we drilled a test borehole to a depth of two kilometres and analysed the data and rock samples for information on the crust needed for the actual production wells.. The drilling of the production wells first utilised air hammer drilling technology (often referred as DTH drilling) to reach a depth of 4.5 kilometres. 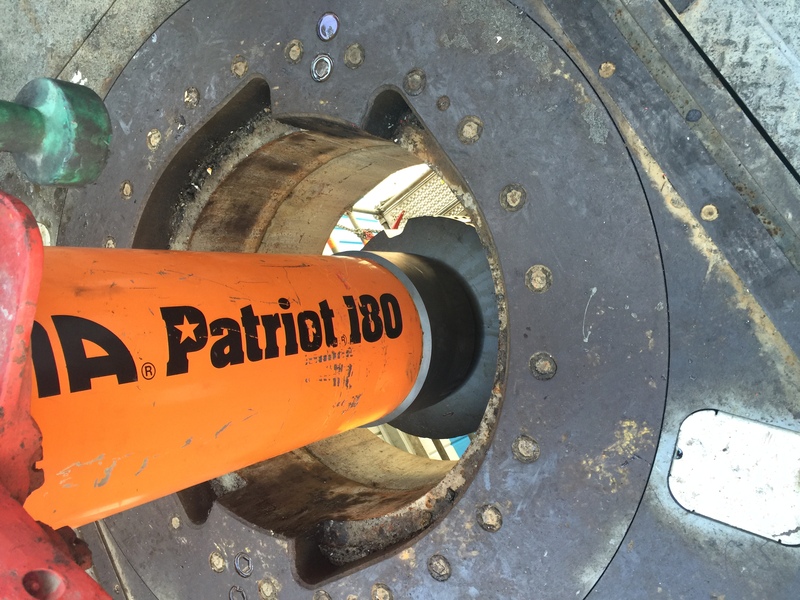 After this, drilling of the first well to the hard bedrock was continued with both water hydraulic hammer drilling technology and the traditional rotary drilling method. By optimising these technologies, drilling has now reached a depth of 6.4 kilometres, deep enough in the crust for a temperature sufficiently high for heat production. Another challenging stage of the project is achieving water flow between the two boreholes. In the stimulation phase we investigated how water injected in the first well flows between cracks in the fractured zone of the bedrock. The purpose of stimulation results is to pinpoint the direction to which the final stage of the second production well should be drilled, and to determine how water is made to flow between the holes deep underground. Geophones installed in the deep boreholes were used to monitor the flow of water in the bedrock. After the stimulation stage, the collected data on water flow is analysed. Analysing the results takes about 5 to 7 months, during which drilling is paused and there is time to optimize and further develop the drilling technology more cost-efficient. The geothermal heat plant is designed to cover up to 10 percent of the district heating needs of the city of Espoo. Success of the pilot project also means that the technology can be applied elsewhere. Geothermal heat plants are already in use in countries such as France and the United States. Iceland, for example, has already been producing all its needed heat and half of its electricity needs with geothermal energy already for years, thanks to its favourable geological location. The video recording of public event (in Finnish) of Otaniemi geothermal project of St1 . It was arranged in Otaniemi on May 14, 2018. Why is St1 building a geothermal heat plant in Otaniemi? Geothermal energy is a promising option when it comes to zero-emission heat production. The goal of the Otaniemi pilot project is to test and develop technically functioning and economically viable solutions to all stages of geothermal business concept – in order to be able to commercialise the concept after the pilot. There are many challenges in the pilot project, however, its success may revolutionise Finnish heat production. Are there corresponding geothermal heat plants already in use elsewhere in the world? There is a plant operating in corresponding geological environment in Soultz, France, for example. Geothermal heating plants have also recently been constructed in Germany, with more planned. There have been plants in a more favourable geological environment, Iceland, for years, now. What does the stimulation stage of the project mean in practice? Stimulation is the process of generating micro-vibrations in the bedrock. This is a normal stage in the construction of a geothermal plant. Water will be pumped down into the first borehole and it will flow through the bedrock fissures. The flow data will enable us to determine the best direction for drilling the remaining section of the other borehole. How can one monitor the flow of water deep in the bedrock? The underground geophone network installed deep in the rock enables us to monitor the flow of water in the bedrock precisely. Could stimulation in Otaniemi cause larger vibrations than micro-vibrations? The ground level effects of stimulation in bedrock at depths of several kilometres are minimal or non-existent. For example the blasting stages of metro tunnelling cause much larger vibrations. Can one sense the micro-vibrations? How do they feel at ground level? It is highly unlikely that one can feel them at ground level. Should this happen, the first ones to sense them would be animals, such as dogs. If a human being senses micro-vibrations, they sound like a tram or snow plow going nearby. The sound has been describes also as thunder or bang. Sound waves can also resonate e.g. in windows and structures. The institute of seismology at the university of Helsinki is controlling the project. Why and how? The Institute of Seismology at the University of Helsinki is responsible for regulatory control of the project and will monitor progress at the request of the City of Espoo using its own instruments. In addition, they have real time access to St1’s measurement data. How long does the stimulation stage take and what will happen after that? The stimulation stage will take about six weeks to complete, and will be followed by an analysis of water flows in the bedrock with further development of drilling technology occurring during the pause in drilling operations. The drilling rig will be dismantled and removed from the site when this intermission begins. Do you want to ask more about the project or send us feedback?